The Flymo XL500 Petrol Power Air Cushion Mower is a durable, practical and powerful mower designed for both domestic and professional usage, with all the advantages of air cushion mowing afforded without sacrificing the benefits of petrol power mowing. The XL500 is designed with ease of use and manoeuvrability in mind, with the Honda engine being usable at slopes of 45 degrees, meaning even more garden spaces can be maintained. The engine itself is a 4 stroke 160cc, 4.1KW GCV160 model, which is known for reliability and performance. The model is quieter than many other models on the market, leading to a decrease in noise pollution for environmentally conscious gardeners. The model includes a durable and high quality metal blade which measures 50.5 cm, which can be used over and over when the proper maintenance is applied. This feature gives you a broader cut for a faster, more efficient gardening experience. The hood is durable and resistant to chemical and normal weathering, further guaranteeing the durability and extended life expectancy. Assembly is simple and quick, with the tools required for construction provided with the mower. The depth of the cut desired will need to be set, and this is easily accomplished by adding spacers between the blade and deck. The XL500 comes with two spacers. The spacer fixing is a simple task and a tool to accomplish this is supplied in the box. The mower can also be tilted onto its side for ease of access to adjusting the spacers or changing the blade. It can only be tilted one way and there is a helpful label on the side of the machine that informs you of the correct side to tilt it on. Then you simply need to add engine oil to the engine, fill the tank with petrol and you are ready to begin operating the mower. The intelligent design of this petrol lawnmower model is further emphasised by the operator presence control lever, and its counterpart; the choke control lever. The levers are both fitted as standard and thus ensure a higher level of control and precision whilst using your mower. Furthermore, the handles fold down for an increased convenience, allowing the model to be easily collapsed and stored, or making it alternatively ideal for business use thanks to a simple and easy transport. Overall, theXL500 is a powerful competitor to other models on the market, designed for use in various different types of situations. 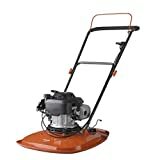 The well built and performance oriented engine ensures a consistently high quality of gardening. Due to the durable and practical nature of the mower, the increased weight is a small price to pay for such an increase in power and results. The model is easy to assemble and comes with the tools required so you can set it up and begin using the model almost immediately. The heavy size belies the fact that this is a manoeuvrable and extremely responsive system that boasts a tight and responsive control system.